Balan Moses (NST), Dato' Syed Nadzri (NST), En. Hasidin (JPNJ), Datin Dr. Maimunah (M Suite) & Vincent (JELTA) during the opening ceremony. Pn. Sallina Hussain, Pengetua Cemerlang & my mentor. I hope I can emulate her dedication and teaching fervour. 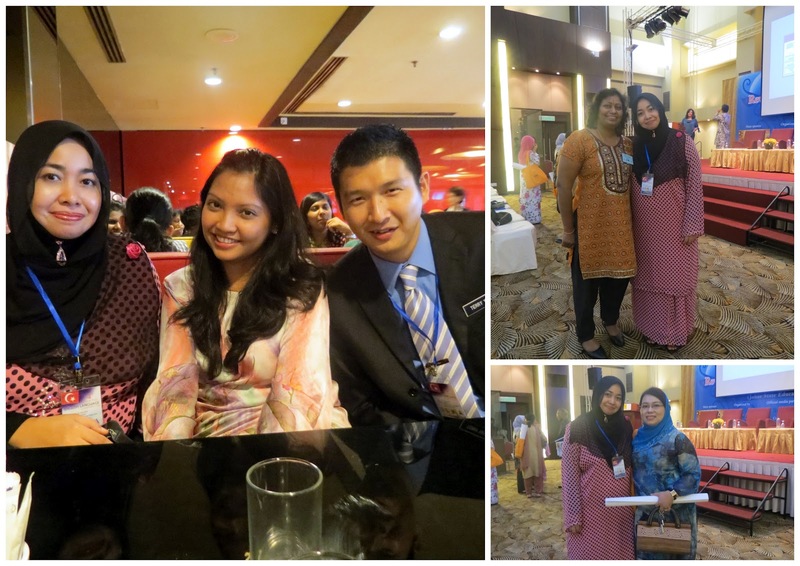 Wonderful people I've met during the conference. I met and networked with a lot of teachers and I think a conference is a great platform to engage ourselves with new teaching methodology or keep abreast with the latest info pertaining to ELT in Johor. It was great to be reunited with my juniors, Intan & Terry. The ever bubbly Kak Rocky is someone who I respected as well. I used to be in awe of her due to her active participation in debate and drama so it's great to know she has now become a cool friend too. Meeting Uma from St. Andrew's Muar is serendipitous indeed. We used to teach at La Salle Brickfields and knew the same circle of friends. What a small world! Sharing session with the conference participants. It was heartening to get positive feedbacks from them on the materials I've shared. Of course, there is always room for improvement and I will constantly try to improve my presentation skills from time to time. For those who are asking for the presentation slides, enclosed is my presentation and I hope it could benefit others as well. Sharing is caring! Venue : Sunway Putra Hotel, Kuala Lumpur. The opening ceremony. 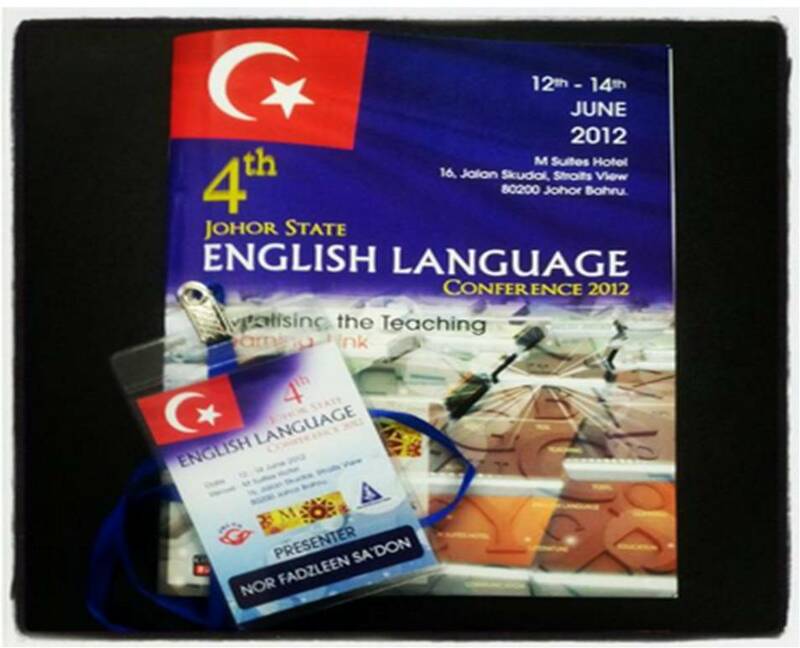 This year, the conference is held at 2 venues, KL and Kuching. This has been my 4th time participating in MELTA conference, all using my own expenses. 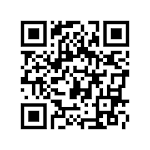 I perceive it as a good platform to share ideas, revive my learning styles and network with other educators. HRH Raja Zarith Sofiah Almarhum Raja Idris Shah, the royal patron of MELTA. I did the 'crazy' bit by sharing my action research during the Creative Teacher Showcase and conducting workshop during the conference. The main idea was to share what I've done with my students but I tell ya, it's kinda taxing and I missed some of paper presentations from others too :( Maybe next time, I'll reconsider doing both in the next conference. On the bright side, I got the chance to showcase the project that I've conducted with my students. 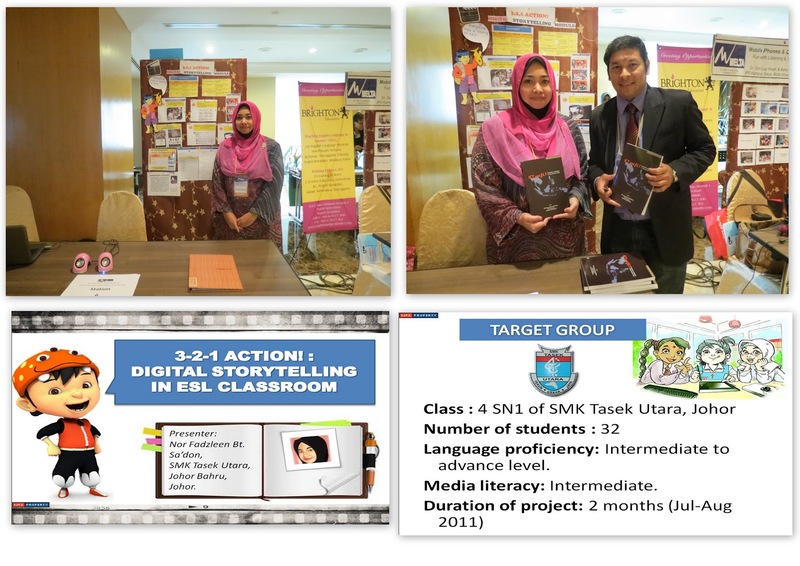 The biggest perk is to get Dato' Dr. Khair B. Mohd Yusof, Deputy Director General, Ministry of Education and Datin Dr. Siti Zaleha Abdullah Sani, Director, Bahagian Teknologi Pendidikan (BTP) dropping by at my booth to watch the videos made by my students. I think E-Learning would definitely be a great catalyst to motivate our students to learn better and discover their true potentials. I'm happy that my book is finally out and launched during the 21st MELTA Conference. 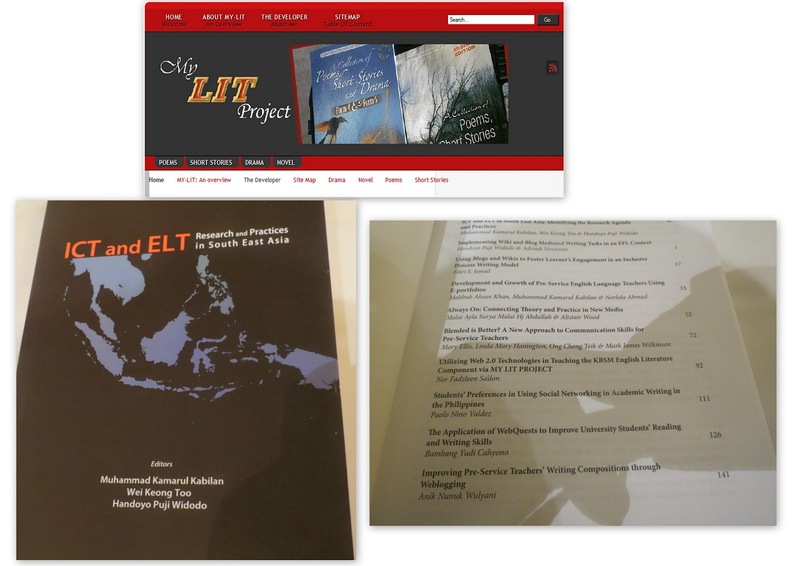 The book, 'ICT and ELT: Researches and Practices in South East Asia' is the first book that focuses on the use of ICT in English Language Teaching in South East Asia and I'm glad to be part of this project. You can purchase the book via the MELTA's website. 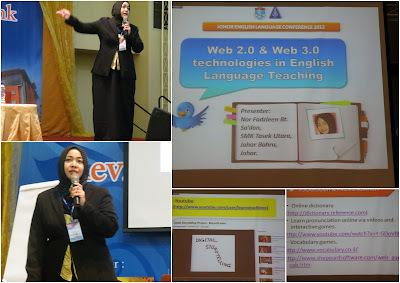 I wrote a chapter entitled 'Utilising Web 2.0. technologies in teaching the KBSM English Literature Component via MY LIT PROJECT', a classroom-based action research that I had conducted with my students back in 2010. I've presented it during the 19th MELTA Conference and it was featured in The Star newspaper as well. Dr. Kabilan proposed that I write it as an academic write-up and honestly, I was kinda apprehensive at first because it's my first attempt at academic writing after years of graduating B.ed in 2001. Nonetheless, I took it as an opportunity to enrich my writing skills and share what Malaysian teachers are doing in classroom. I was surprised to know that I'm the only teacher contributor among the distinguished South East Asian lecturers. Thanks Dr. Kabilan for the vouch of confidence and I hope this will not be my last attempt. The workshop that I've conducted on the last day of conference. 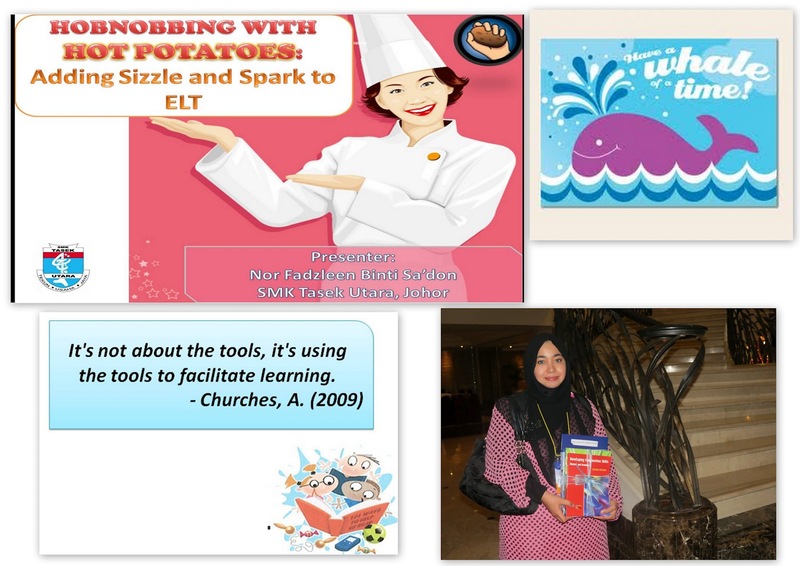 I decided to do a workshop on Hot Potatoes although I am aware there are so many latest E-Learning tools such as Edmodo, QR Code and other social networking sites that cater to classroom teaching and learning. The main reason why I did it is to encourage teachers to generate their own learning materials, to suit their students' invidual needs. Since Hot Potatoes can be used online or offline, it shouldn't be any qualm for teacher not to try this in school. To me, Hot Potatoes can be used to generate revision materials, extra reinforcement activities for students and students enjoy it as they are interactive and game-like. I'm glad that the workshop received good response from everyone and a lecturer even suggested I write a paper on this in the MELTA journal so I can share this with everyone. Alhamdulillah, I was awarded Bronze for Basil Wijayasuriya Award as best teacher presenter. For me, it was unexpected because I presented for the sake of sharing ideas and experience. After all, there are a lot of more experienced teachers such as Kak Rahmah and Ms. Shantini who are reknowned Guru Cemerlang (Master Teacher) in Malaysia. Honestly, I feel that we need to give support for more teachers to contribute and share ideas at conferences. My journey hasn't been smooth sailing, my intention of blogging, carrying out action research, doing innovation and sharing ideas at conferences has sometimes been misunderstood by the admins and fellow colleagues but I move forth because I feel when the going gets tough, the tough gets going. When I was having Tweet discussion with Zaid AlSagoff and Will Deyamport last night, I realise that the most important part of being an teacher is to do what you believe would benefit yourself and your students in a long run. The journey may be painstaking but eventually, things will start to brighten up and the best satisfaction is inspiring others to make a difference.